One of the winning images of the 2014 Nano Today Cover Competition. Look out for more cover competition winners, here on Materials Today. The new issue of Nano Today (Volume 9, Issue 3) is out now. Click here to read the articles. Intense research efforts are related to carbon monoxide (CO) as potentially valuable therapeutic agent. Many physiological effects are documented for controlled application of CO, such as anti-inflammatory effects, regulation of blood pressure, modulation of vascular smooth muscle tone, protection against ischemia and septic shock as well as hyperoxia. In addition, CO suppresses organ graft rejection and arteriosclerotic lesions. In the body the gasotransmitter CO is produced via heme degradation. Here we report the concept of embedding water-insoluble, photoactive CO metal complexes into nanofibrous polymer non-wovens. [7,10] CO release into the sur­rounding medium is performed by light stimulation of the high surface area materials. The photoactive CORM Mn2(CO)10 has been non-covalently embedded into poly(L-lactide-co-D/L-lactide) (70:30; PLA) fibers via electrospinning from a chloroform solution. [4,6,7,9,10] A slight CO release from Mn2(CO)10 in the electrospinning process with light irradiation is probably responsible for the nanoporosity in the resulting fibers. Electrospinning of the viscous mixture in the dark resulted in almost smooth fibers. 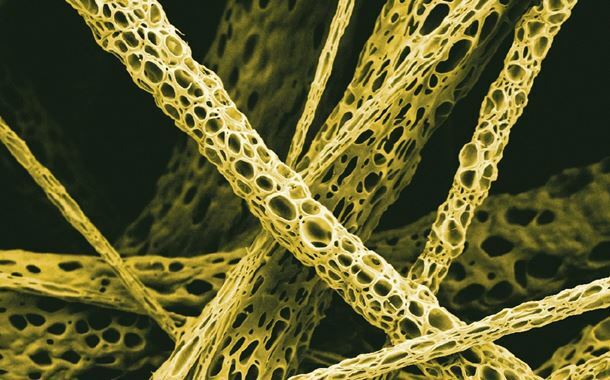 The cover image on Volume X, Issue X of Nano Today shows a scanning electron microscopy image of the hybrid non-woven revealing the nanoporous morphology of the fibers. The nanoporosity can be adjusted with the content of Mn2(CO)10 and wavelength and intensity of the light used in the electrospinning process. This is the first time that photo-triggered porous morphology can be induced in electrospun fibers with a metal carbonyl complex. Cytotoxicity tests with 3T3 mouse fibroblast cells in the dark revealed a very low mortality rate. However, the hybrid material exhibited strong photocytotoxic properties. When the non-woven was exposed to light (356 – 480 nm, ~ 3 mW/cm2) CO bubbled out of the nanofibers thereby eradicating 3T3 mouse fibroblast cell cultures [7,10] or biofilms with methicilin-resistant Staphylo­coccus aureus (MRSA). Besides the possible use of triggered CO release for several medicinal applications this kind of CORMA could be developed technical fields e.g. CO calibration systems. Furthermore, the technique of preparing highly porous materials possessing with very high surface areas can be also used for the design of filters, catalysts, or electrodes. The nanoporous non-woven was generated at INNOVENT e.V. Biomaterials Department (Jena, Germany). It resulted from an ongoing joint collaboration between INNOVENT and the Institute of Inorganic and Analytical Chemistry of the Friedrich Schiller University of Jena in Germany. The research focuses on NO and CO releasing materials, such as non-wovens and particles and is embedded in the DFG research unit FOR1738 “Heme and heme degradation products (HHDP)”. An interdisciplinary team of researchers from diverse disciplines such as neurology, intensive care medicine, molecular physiology and biophysics, biochemistry, biophotonics as well as synthetic and analytical chemistry investigate the generation of HHDPs and their alternative functions and signaling mechanisms. Acknowledgments: We thank the Deutsche Forschungsgemeinschaft (DFG) for supporting FOR 1738. A.S. is grateful to the Carl Zeiss foundation for a Junior Professor fellowship and the EC for financial support through the FP7 project ‘Novosides’ (grant agreement nr. KBBE-4-265854). The German Federal Ministry of Economics and Technology (BMWi) is gratefully acknowledged for financial support (grant no. MF110109). We also acknowledge the support of the Center of Medical Optics and Photonics (CEMOP), the Abbe Center of Photonics (ACP) and the Jena Center of Soft Matter (JCSM) at the Friedrich Schiller University Jena. We thank cordially Dr. M. Schweder (INNOVENT e.V.) for assistance with SEM analyses. Further reading:  R. Motterlini, L. E. Otterbein, Nat. Rev. Drug Discov. 2010, 9, 728-743. S. H. Heinemann, T. Hoshi, M. Westerhausen, A. Schiller, Chem. Commun. 2014, 50, 3644-3660. D. Crespy, K. Land­fester, U. S. Schubert, A. Schiller, Chem. Commun. 2010, 46, 6651-6662. R. Wyrwa, B. Finke, H. Rebl, N. Mischner, M. Quaas, J. Schaefer, C. Bergemann, J. B. Nebe, K. Schroeder, K.-D. Weltmann, M. Schnabelrauch, Adv. Eng. Mat. 2011, 13, B165-B171. A. Schiller, in Mole­cules at Work. Selfassembly, Nanomaterials, Molecular Machinery, (Ed. : B. Pignataro), Wiley-VCH, Weinheim, 2012, 315-338. C. Bohlender, M. Wolfram, H. Görls, W. Imhof, R. Menzel, A. Baumgärtel, U.S. Schubert, U. Müller, M. Frigge, M. Schnabelrauch, R. Wyrwa, A. Schiller, J. Mater. Chem. 2012, 22, 8785-8792. R. Wyrwa, M. Schnabelrauch, C. Altmann, A. Schiller, DE10 2012 004 132.2. C. Bohlender, K. Landfester, D. Crespy, A. Schiller, Part. Part. Syst. Charact. 2013, 30, 138-142. A. Gugerell, J. Kober, T. Laube, T. Walter, S. Nürnberger, E. Grönniger, S. Brönneke, R. Wyrwa, M. Schnabelrauch, M. Keck, PLoS ONE 2014, 9, e90676. C. Bohlender, S. Gläser, M. Klein, J. Weisser, S. Thein, U. Neugebauer, J. Popp, R. Wyrwa, A. Schiller, J. Mater. Chem. B 2014, 2, 1454-1463.